Decision: Which Leader is Better - Gurzag or Fjul-Grimnir? Fjul-Grimnir is probably slightly better, and his value goes up significantly when you factor in his access to cards. But Gurzag is still #1 in our hearts. 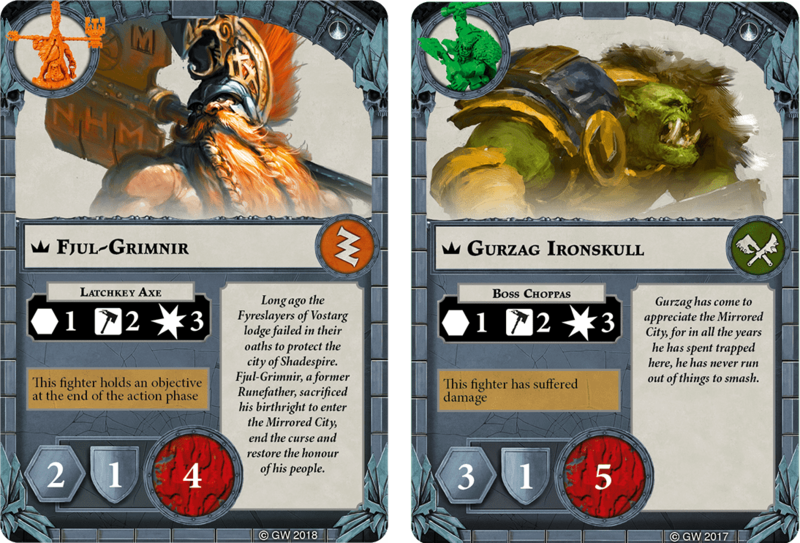 Anyone who's been playing Shadespire for a while now has no doubt seen both Gurzag Ironskull and Fjul-Grimnir bandied about as two of the best single models in the game. For what they do - smash heads - that's likely true. 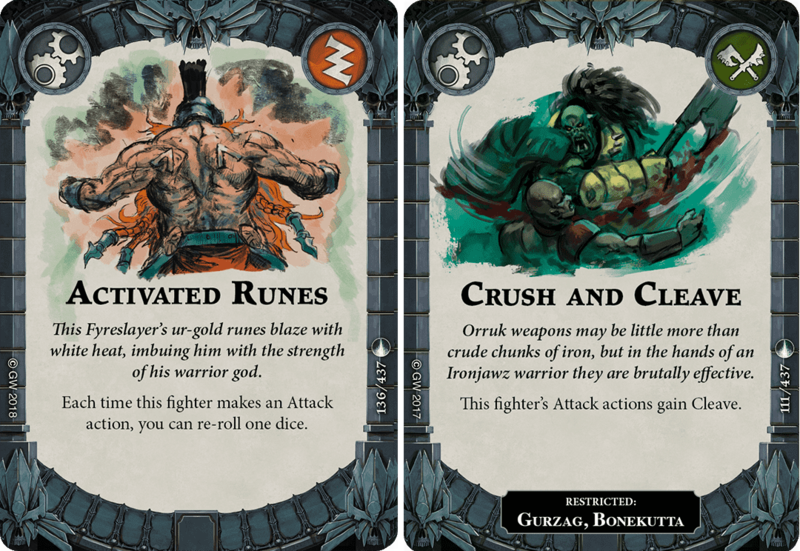 When reading this article, please keep in mind that we're really only looking at these two axe bois in terms of what they do; Stormsire may well be overall better than either one of them, but he doesn't really fulfill the same purpose in your warband. 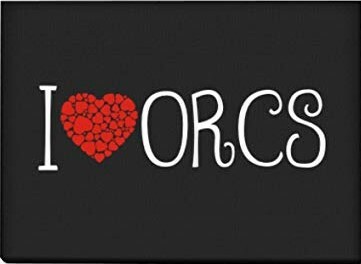 Let's try not to compare apples and orcges. Both units have fairly similar base stats. They share a 1-shield defense, and Boss Choppas and Latchkey Axe are identical. Gurzag has a pretty clear advantage here, as he has one wound and one movement over Fjul. If we were to use the "glory spent" metric that we used in a previous article, we could see that in order to equal Gurzag, Fjul would need to spend 2 glory on upgrades - Great Fortitude and Great Speed. This round clearly goes to the green guy. Gurzag has a definitive advantage here, inspiring whenever he takes damage. It's quite rare to see a turn 2 gray-bordered Gurzag. Fjul, on the other hand, has a bit of a trickier time inspiring, particularly with the resurgence of hold-objective style decks pushing players to include anti-objective meta cards in their decks. Additionally, without help from a card, Fjul can't inspire during the first round. That makes 2 rounds to the Greenskin. Against a 2-dodge defense, Gurzag will do an average of 1.83 damage per swing. Fjul will do 1.88 per swing thanks to his higher damage output, but will miss more often than he will hit. Against a 1-shield defense, Gurzag will do an average of 2.1 damage per swing, while Fjul will do 2.6, thanks to the increased accuracy from cleave. In both cases, Fjul does more damage on average. However, the race against dodge based armies is much closer, and Gurzag's higher accuracy and critical rate will allow him to more consistently take advantage of various ploys and upgrades that increase damage. If we once again use a glory-spent method of comparing the two, Gurzag would have to use 2 glory on Incredible Strength and Crush and Cleave to surpass Fjul. Fjul would then only need to spend 1 glory on Awakened Weapon to equal the two out. While not as much of a blowout as it seems on first inspection, this round definitely goes to the dwarf. In terms of objectives, both models have some similar options. A Grim Promise and Get da Boss, for example, are identical, as are Oaths Still to Fulfill and 'Ard as Iron. 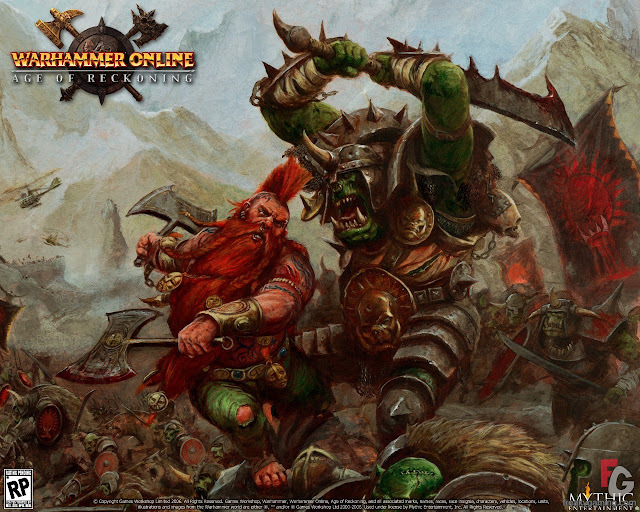 In a few cases, one warband has an objective that is simply better than the other. Call of the Waaagh!, for example, is better than Fury of the Lodge in every way. Similarly, Scion of Grimnir does everything that Biggest an' da Best does, only it scores immediately! When it comes to more unique objectives, the dwarves pull ahead. Ferocious Charge is an objective that Orks would kill to have, and Unstoppable Advance serves as a backup for Conquest. 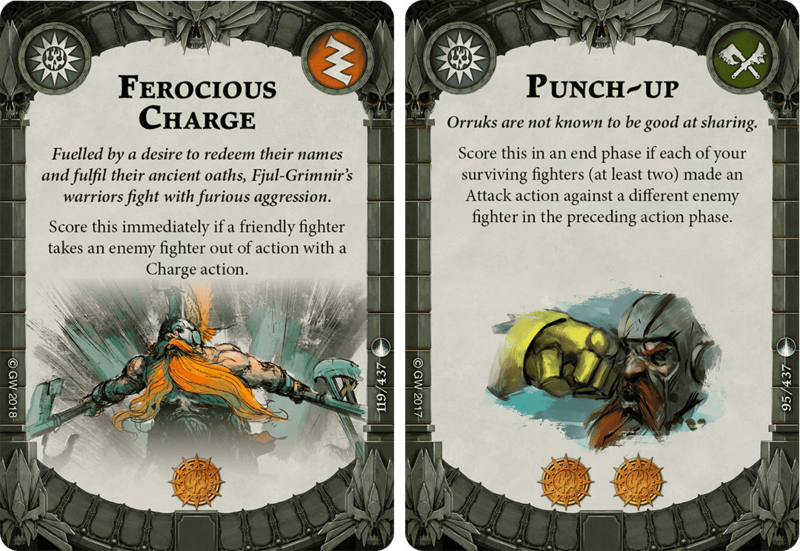 The Orks get Good Scrap and Punch-up, both useful in niche situations, but they simply don't have the general utility of the dwarf objectives. Gurzag has access to a good array of utility ploys, the most notable being Brutal but Kunnin' and Kunnin' but Brutal. 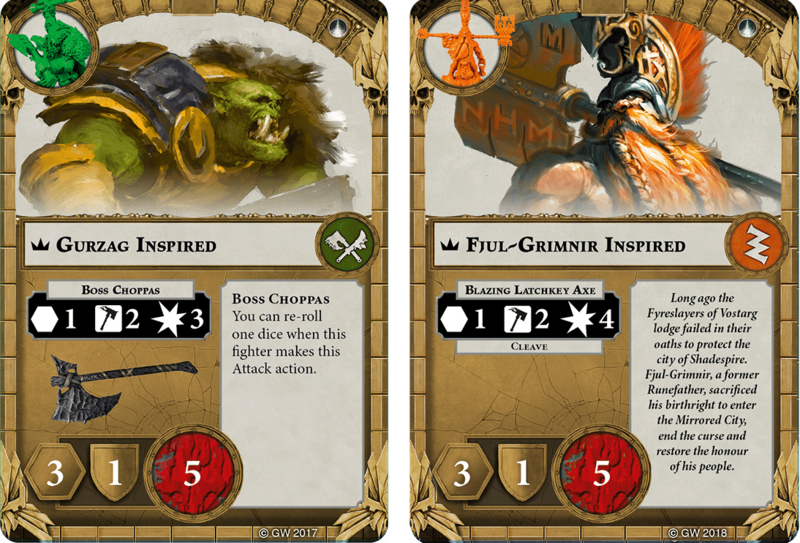 Additionally, the Orks get a number of ploys that can generate additional attack actions, though none are terribly reliable. More Choppin' rounds out the list of good ploys available to the Orks, especially when used by Gurzag. Where Gurzag's ploys are solid, Fjul's are bonkers. 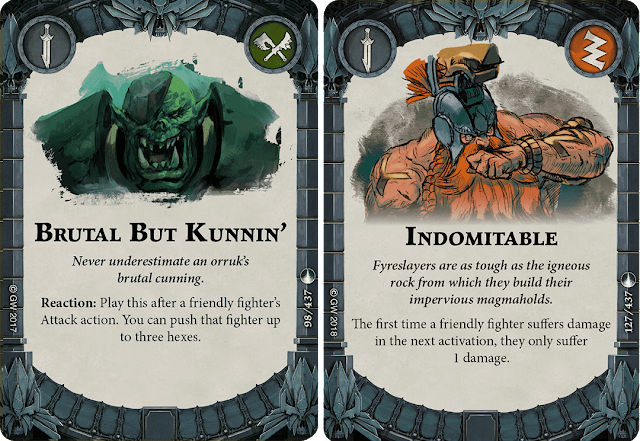 Treasure-lust provides almost unequaled mobility, while The Earth Shakes takes two of the best utility cards in the game and combines them. Indomitable provides an extremely powerful effect, and one that isn't available to most other warbands. Piercing Stare, similarly, provides a unique and extremely powerful effect, especially against smaller warbands. Finally, Oathsworn makes the Orks turn green (greener?) with envy, as it provides a way to help guarantee that devastating attacks from your leader land. Each warband only has one upgrade that any model can equip, and Fjul's Activated Runes far outshines Waaagh! Similarly, Fjul gets the better selection of model-specific upgrades, with Grimnir's Speed, Fortitude, and Blessing all providing effects that are simply better than any universal option available. Gurzag's best model-specific upgrade is Crush and Cleave, which has an extremely powerful effect, but it does lose some of its shine when we note that Inspired Fjul already has cleave. When we examine Ploys, Upgrades, and Objectives together, it's quite clear that the bearded maniac gets the better selection to choose from. Each leader comes tied to the other models in their warbands, so it's worth taking at least a brief look at what kind of support they can expect. We'll start with the models that measure up the closest to their respective bosses: Tefk and Bonekutta. On the uninspired side, Bonekutta has a clear advantage in wounds, speed, and inspire condition. Tefk has an additional high-accuracy/low-damage attack, but it's not enough to make up for his lack of mobility and relative flimsiness. When inspired, however, Tefk becomes the clearly superior model. 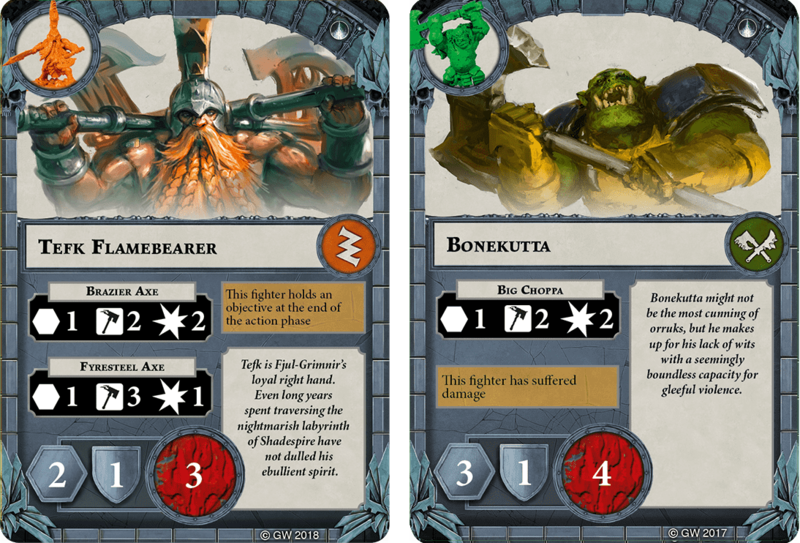 He rises to meet Bonekutta's speed and wound count, while picking up a clearly superior attack with a possibility to cleave. This is somewhat balanced by the fact that Tefk is much harder to inspire than Bonekutta, but on the gold side, he's simply better in every way. Given the above factors, we think it's fair to call this one a wash.
As we've seen with the other models, the Orks here each have one more wound and one more speed than the dwarves when not inspired. 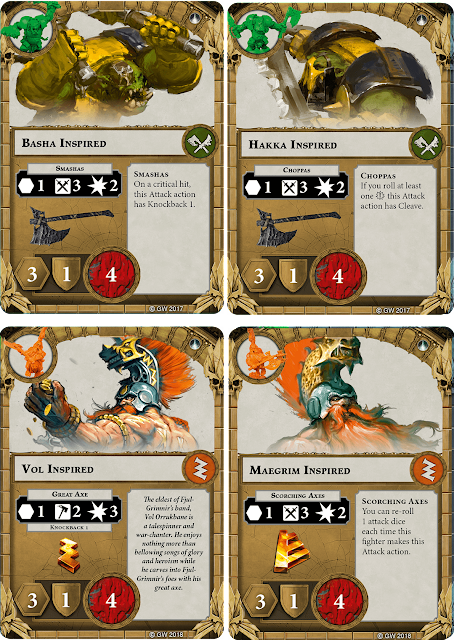 The dwarves' attacks are both better than the Orks' attacks; Hakka and Basha both put out 0.556 damage per unblocked attack, while Maegrim and Vol do 0.737 and 1.5(!) damage per unblocked use respectively. Vol's drastically higher accuracy and damage might put him above the Orks despite his reduced mobility and health, but Maegrim's slightly better accuracy doesn't come close to closing the gap. 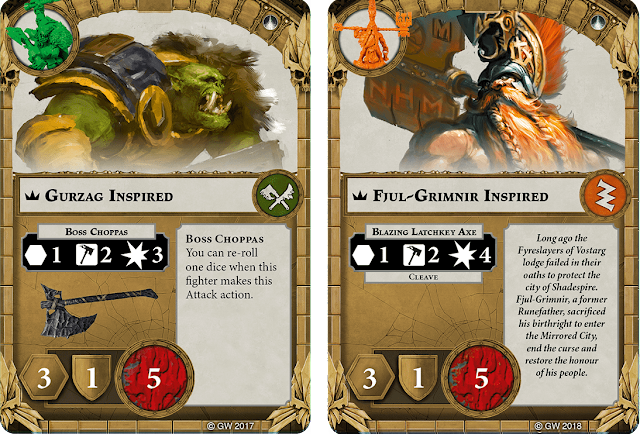 Once again, it's worth mentioning that the Orks are much easier to inspire than the dwarves, so that should also be weighed. Once inspired, Basha and Hakka each pick up an attack die, an additional point of damage, and an effect when they roll a critical. 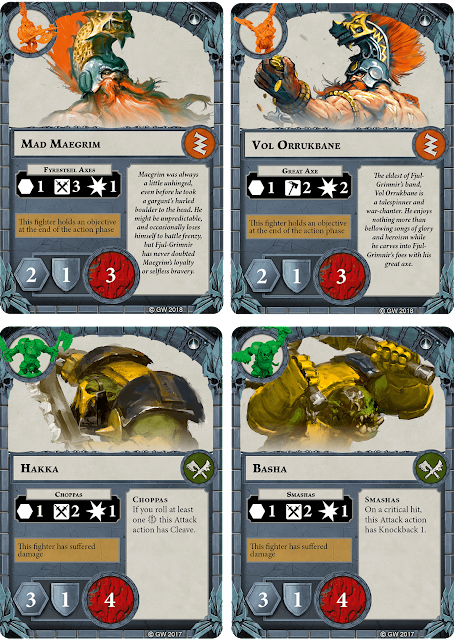 Vol and Maegrim pick up attack improvements as well, and both gain a wound and a movement hex, bringing their bottom-line stats into equilibrium with the Orks. Basha and Hakka now each put out an average of 1.4074 damage per unblocked use. Vol continues to stay way ahead of the curve in terms of average damage output, rising to 2.25 per unblocked attack. Finally, Maegrim picks up a reroll, making his average unblocked damage 1.605. Add on to that the fact that Vol always has knockback (rather than only on crits like Basha), and it's clear that the dwarves have the upper hand post-inspiration. Taken as a whole, it's reasonable to say that the Orks and Dwarves have similar support models. Vol is somewhat of a standout, but his low health and mobility on the front side are particularly crippling when coupled with a rather difficult inspire condition. Once again, we're calling this one a draw. 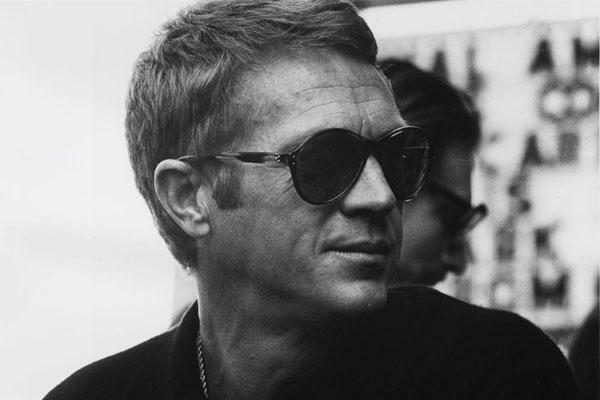 Finally, it's time to look at the most important factor of all: Coolness. Fortunately, this is an aspect of design that is dead easy to view objectively without any bias whatsoever. First, we have Gurzag. He's the Steve McQueen of Shadespire - just look at that winning smile. He's the epitome of a bad-boy warchief, and he even has the east-end cockney accent to go with it. His underlings, Hakka, Basha, and Bonekutta, all sound like they belong to the nastiest 1890's British street gang imaginable. He's wearing a shining suit of golden armor and wielding two - two! - devastating axes. Then we have Fjul-Grimnir. Obviously, he's got some battle chops, but he's running around half naked like some kind of unmarked-van-candy connoisseur. He's traipsing around Shadespire with a madman, a bard, and a sycophant in tow - it's essentially a D&D party designed by a middle school choir club. And don't get us started on that axe; Kingdom Hearts called, and Sora wants his toy back. *Extremely Professor McGonnagall Voice:* 10 points to Griffondork. In their uninspired states, Gurzag is clearly a superior model to Fjul. While Fjul overtakes Gurzag once they are both inspired, it's significantly more difficult to inspire the dwarf. Similarly, Gurzag's cronies are almost all better than Fjul's when the aren't inspired, but fall behind once inspiration strikes. 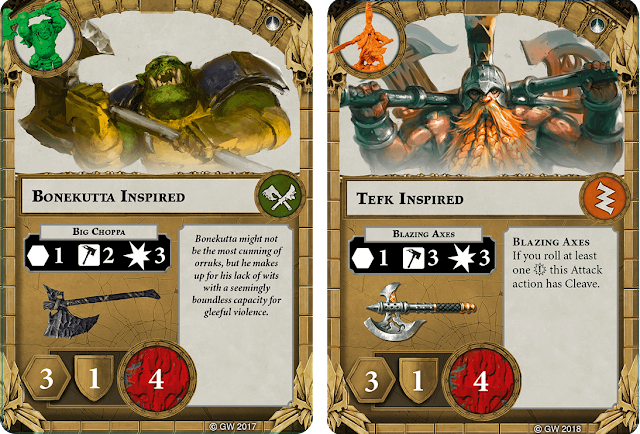 Coupled with a far better selection of cards, the superiority of the inspired dwarves probably pushes Fjul ahead in the final evaluation - as long as you don't mind a guy who swings a keyblade he bought at Hot Topic and thinks his beard is clothes.